Welcome to Fun Holiday Beach Resort located on Negril's Spectacular 7-mile white sand beach, 52 miles from the Donald Sangster's International Airport Montego Bay, minutes walk to sizzling nightlife on the town. Let Fun Holiday Beach Resort be your hotel of choice. Located on the world famous Negril Beach, we overlook the Caribbean Sea and it's breathless Sunsets! 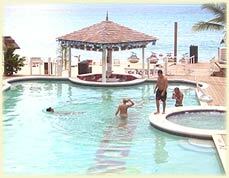 Only seconds from the water and fun that is Negril Jamaica! Swim in crystal clear waters, including our freshwater beach pool and hot tub! Feel the warmth of our tropical sunshine, spend some time tanning on the most beautiful white sandy beach in all of Jamaica. Have fun and ride our jet skis or rent a scooter or car and let the sunshine in! Enjoy the Fun Time Band for live reggae 2 nights a week at our beach restaurant that features seafood and Jamaican delicacies! For more late night fun, check out the disco across the street! Five minutes from horseback riding and golf as well as banks and shopping and ATMs, Fun Holiday is the perfect vacation spot! On premises car, jeep and jeep rentals for when you aren't spending time in your air conditioned room watching the cable TV or listening to the CD player (optional) and ordering Room Service from our beach restaurant! Live Entertainment At "Fun Holiday Beach Resort Negril" Come and enjoy the sights and sounds of "Live Musical Entertainment" at least two (2) nights of the week featuring some of the best local reggae bands from Negril and the surrounding townships. Our beachfront restaurant specializes in seafood, we offer Lobster, Seafood Combos, Fish, Crab and Conch, all freshly caught from the Caribbean Sea the same day. Our authentic Jamaican Jerk Chicken and Juicy Steaks will satisfy your appetite. Why not bring a friend!? We offer 2 for the price of 1 for Lobster Specials, Seafood Combos, Fish and Conch on most nights! Along with our great dinners Enjoy one of our many cocktails, Pina Coladas and our famous tropical fruit daiquiris, banana, strawberry or mango. By the way, they are known to be the best on this island ! EVERY NIGHT 2 for 1 prices. It's 2 for 1 All the Time Our beachfront bar specializes in 2 for 1 drink specials all of the time. The best drink specials on Negril's seven (7) mile beach. Come see for yourself why Fun Holiday is second to none in Negril. Enjoy one of our many cocktails, Pina Coladas and our famous tropical fruit daiquiris, banana, strawberry or mango. By the way, they are known to be the best on this island !